What are Spotify’s password requirements? When you’re creating a new Spotify password, you might be wondering what the rules and minimum requirements are for your new password. 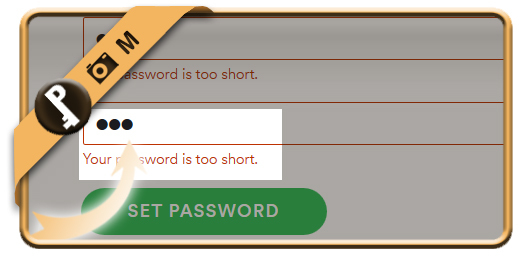 Passwords must have at least 4 characters. We tested up to 500 characters and it still worked so we conclude that there’s no maximum length for a password. Spotify advices that a password should contain a mix of capital and lower-case letters, numbers and symbols, but it’s not necessary. So a password like pass would work! A new password can be the same as a previous one. What are Adobe’s password requirements? What are AOL’s password requirements? What are PayPal’s password requirements? What are Wechat’s password requirements? How to change a Oovoo password? Forgot my Oovoo password, now what? How to change a Tagged password? Forgot my Tagged password, now what? Forgot my Groupon password, now what? How to change a Groupon password? How to change a Nimbuzz password? Forgot my Nimbuzz password, now what? How to change an Adobe password? Forgot my Adobe password, now what? Forgot my Samsung password, now what? What are Samsung’s password requirements? How to change a Dropbox password? Forgot my Dropbox password, now what? Forgot my Vine password, now what? How to change an Instagram password? Forgot my Instagram password, now what? How change a Monster password if you forgot it? Forgot my eHarmony password, now what? Forgot my Line password, now what? How to change a Fitbit password? How to change a LogMeIn password? How to change a Line password? Forgot my Imvu password, now what? How to change an Imvu password? How to change a Badoo password? Forgot my Badoo password, now what? Forgot my Snapchat password, how reset it? How to change a Kik password? How to change a Tango password? How to change a Wechat password? Forgot my Wechat password, now what? Forgot my Kik password, now what? How to change a Snapchat password? What are Snapchat’s password requirements? How to change a WordPress password? How to change BBM password if you forgot it? Forgot my WordPress password, how reset it? How to change a SoundCloud password? Forgot Plenty Of Fish (POF) password, how reset it? How to change a Plenty Of Fish (POF) password? How to change a Craigslist password? Forgot my Craigslist password, how reset it? How to change a Pinterest password? How to change a MySpace password? Forgot my MySpace password, how reset it? How to change a Tumblr password? What are Tumblr’s password requirements? Forgot my Tumblr password, how reset it? How to change an AOL password? Forgot my AOL password, how reset it? Forgot my Pinterest password, how reset it? How to change an Amazon password? What are Amazon’s password requirements? Forgot my Amazon password, how reset it? How to change a Skype password? How to change a PayPal password? Forgot my PayPal password, how reset it? How to change a Spotify password? Forgot my Spotify password, how reset it? What are Skype’s password requirements? Forgot my Skype password, how reset it? How to change an eBay password? What are eBay’s password requirements? Forgot my eBay password, how reset it? How to change a Linkedin password? What are Linkedin’s password requirements? How to change a Hotmail (Outlook.com) password? What are Twitter’s password requirements? Forgot my Twitter password, how to reset it? How to change a Twitter password? Forgot my Linkedin password, how reset it? What are Yahoo’s password requirements? What are Gmail’s password requirements? Forgot my Yahoo password, how to reset it? How to change a Yahoo password? What are Hotmail’s password requirements? Forgot my Hotmail (Outlook.com) password, now what? Forgot my Facebook password, how to reset it? Forgot my Gmail password, how to reset it? How to change a Gmail password? How to change a Facebook password? What are Facebook’s password requirements?